How many people do you know have enjoyed a private dinner with George W. Bush, won a journalism award writing for Reuters, speaks five languages, served on the Governor’s Cabinet of George Voinovich, and traveled the world while banking with First National Bank of Pandora? If no one came to mind, then you haven’t met M. Michael Akrouche of Beirut, Lebanon. Michael has been a customer at First National Bank for over 50 years and has truly led a remarkable life. He was born and grew up in Lebanon and moved away from home after college to take a job writing for Reuters of London. His job took him all over the world to write about Lebanese natives who left for economic and religious reasons and found success outside their home country. Michael won a journalism award for a piece he wrote about the grandson of a Lebanese immigrant who he met in the Caribbean during his travels. account. According to Michael, he has written thousands of checks over the years from his account and is still an active depositor. Mr. Akrouche fondly remembers the first application he completed at the Bank over 50 years ago. He had spent all his time in international urban settings to that point in his life and thought it was humorous that the Bank application asked him how many cows, pigs, chickens, and acres of land he owned! He has continued to use his account at First National Bank throughout the years because he appreciates everything community banks contribute locally and he has enjoyed his interaction with staff whenever he has had a banking request. Department. According to Akrouche, the privatization effort saved the State of Ohio approximately $37 million in the first year. 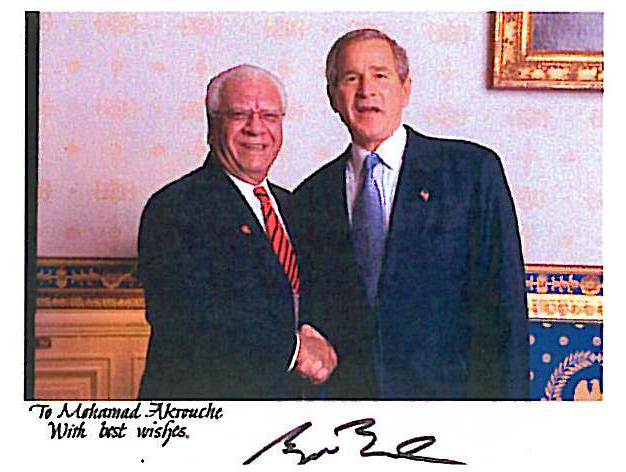 One of Michael’s proudest moments was a personal invitation from George W. Bush to attend a private ambassador’s dinner at the White House with the President in 2005. Mr. Akrouche has been happily married to Mary Walters of Jackson, Ohio for 54 years and counting and has two adult children and five grandchildren. He is now retired and lives in Westerville, Ohio and Florida. We’re flattered to be the Bank Mr. Akrouche chose to visit during his travels, and we have enjoyed getting to know him and his remarkable life story. Do you have a story about your positive experiences banking with First National? If so, we’d love to hear it.